(38) Mens Vintage 70s Western Leisure Jacket! Dark Denim Look w/ Yellow Topstitching! 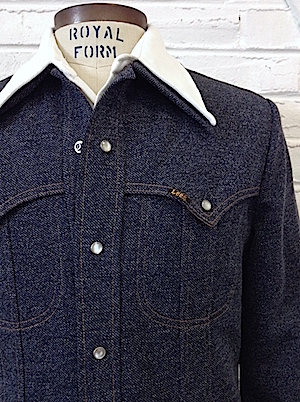 Home > Vintage Jackets > All Vintage Jackets > (38) Mens Vintage 70s Western Leisure Jacket! Dark Denim Look w/ Yellow Topstitching! 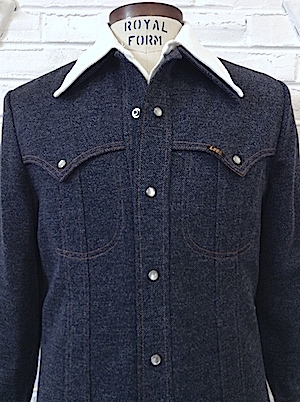 Mens vintage 1970s disco western style leisure jacket! 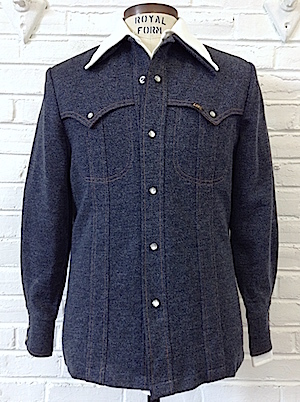 Get you cowboy groove on in this dark faux denim jacket with yellow topstitching! Material has the appearance of a dark denim, but is really polyester or a polyester blend. Super wide 70s collar. Closes in the front with pearly white snaps with three matching snaps on each cuff. Two pockets in the front with pointy western style flap and snap closures. Jacket is vented on the sides. 3/4 lined in a golden yellow acetate. Tagged by Lee. 100% Polyester. Condition: Very Good. Has a very, very faint brown-ish stain on the lower, right, front portion of the jacket. Also has some staining on the acetate on the interior of the jacket. Does not detract from the awesomeness of this jacket!